The percentage of American philanthropy funding that goes toward aging programs is less than two percent. Grantmakers In Aging wants to remedy that. 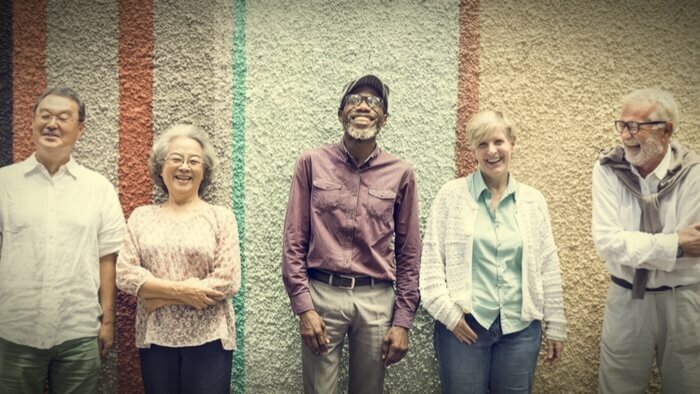 The organization — which began 35 years ago as an informal collective of foundation program officers who felt older adults’ needs were being neglected — covers a broad range of issues in this space, from healthcare to housing to the arts. They don’t award grants themselves, but they do collaborate with funders, launch major initiatives and provide resources for those who want to learn more about the biggest issues affecting the older U.S. population. We spoke with CEO, Dr. John Feather, PhD, about GIA’s impact and why getting older is more of a blessing than any of us realize. Q: What do people usually get wrong when it comes to discussing aging in America? A: The main issue is the sense that aging is somehow different than the rest of life experiences. We tend to think about older adults as “them,” what sociologists call “otherization.” There’s a strong pervasive negative perception of aging, even though it’s an incredible gift to our society that we have so many people living longer. Q: How important is it to understand social isolation among older adults? A: Social isolation is a killer. It has a physical impact that’s equivalent to smoking. But it’s hard to break down. I was at a conference in the Adirondacks recently, and someone raised the issue that one of the disruptive transformations right now is Amazon. You can call up and get anything you want tomorrow. The good news is that, in a place that’s mountainous and snows a lot, older people don’t have to go out to get cat food and groceries and all the other things that they need. The downside is that makes it even more likely that they may not get out the whole winter. Another aspect is neighborliness. One of the things that these recent natural disasters have taught is that older people die at a higher rate in natural disasters. And it’s often because people just don’t know that an older person is living in an apartment building where the electricity went out for two weeks and didn’t think to check on them. We need to end the stigma of social isolation, and raise awareness about how damaging it is. Q: Why should people in non-rural areas pay attention to programs such as the Rural Aging Initiative? A: Because they are closer than they think. If you look at a map of the federally designated “rural areas” — the official census definition — it’s 95 percent of the United States. If you stand in the middle of the biggest cities, you’re two counties away from a place that’s defined officially as a rural area. Many urban-based foundations just don’t know where to go to try to make a difference in these areas. So a lot of regional philanthropy takes on such responsibilities. One of the reasons why we’re doing this initiative is to get information to funders about what’s available to them, what people have done that they can easily replicate, the results of those programs, and so forth. Since you are interested in Public Health, have you read these selections from Giving Compass related to impact giving and Public Health? How Can We End Female Genital Cutting? Giving Compass' Take: • Zachary Slobig how a community engagement approach can end female genital cutting around the world. • How can funders work with communities to develop a culturally appropriate approach? • Learn about the need for data on female genital mutilation in the United States. Some 200 million women and girls alive today have undergone female genital cutting (FGC). Every year, three million more women are violated with FGC—a massive, mostly invisible health and human rights crisis. With that troubling trendline, 15 million more girls could be affected by 2030. Almost three decades ago, Molly Melching launched Tostan—”breakthrough” in the Wolof language of West Africa—to empower communities to bring about sustainable development and positive social transformation based on respect for human rights. What followed was a cascade of locally-led movements. Melching went to Senegal in 1974 intending to stay 6 months. She stayed for almost 40 years. Molly came to believe that education was the key to unleashing that individual and community potential. In 1996, Tostan introduced human rights education into its program. People talked for hours about the human right to health. They talked about the human right to be free from all forms of violence, to be free from all forms of discrimination. That’s when the members of a village collectively decided that they would no longer cut their daughters. “This is a deeply entrenched practice that had lasted 2,200 years in Africa,” says Molly. “And these women stood up and said ‘we know the health consequences now. We must protect our daughters. '” Thus began what would become a systems-level change in Senegal—a broad, grassroots movement to end female genital cutting. Trust and empathy are critical elements of the work to end violations of basic human rights that are deeply enmeshed with cultural practice and taboo. “We really listened carefully and we just followed their lead,” said Molly. “They’re the ones leading this movement for change.” Read the full article on ending female genital cutting by Zachary Slobig at Skoll Foundation. Philanthropy continues to think of aging as something worthy of support, but they don’t see it as a high priority investment as they do programs with children, economic development and other efforts. That should change. Q: Which healthcare innovations do you think have been most successful so far and where do you see things going? A: In 100 years, we went from the average length of life being about 40 years to being almost double that now — almost all due to technological changes. But how do we use technology to provide healthcare for everyone in a broader sense? When it comes to things like gene therapy and other innovations, those have tremendous promise, but they’re also going to be tremendously expensive and have risks. We want to make sure to extend life, but also provide quality of life. And that’s the difficulty sometimes when I go to certain conferences and I hear, “We have the miracle cure for X.” Well, OK, so then what? Q: What are some of the biggest concerns about Medicare and Medicaid? A: We have set up a situation where the deficit, which has just been enlarged enormously, can now be used as an excuse for hacking away at the basic social services programs. Most people, including some people in our legislatures, think Medicaid is a program for lazy, shiftless poor people who don’t deserve it. But most of the money goes to older people in nursing homes, and to children, and to the working poor. It’s not unreasonable to say there will be very serious ramifications if any of this gets translated to cuts for major programs. But the impact to older people is likely to be one of the most contentious issues in the next year. Q: How does family care relate to some of the crucial issues when it comes to aging and the economy? A: The notion that unpaid family caregiving is going to be the solution to our long-term problems has always been fantasy and continues to be. Know that baby boomers are twice as likely never to have been married or to never have had children than the previous generation. So who are we talking about when we say “Our family is going to take care of us?” Who is the person who’s magically going to appear? We have to support those who responsibly provide care for their loved ones. How about this for a start: Let’s have a tax credit for family caregiving.